This chair features a powered lift mechanism to lift its occupant smoothly and safely to their feet. You can recline the chair to whatever position you find most comfortable and relax while you enjoy your favorite book or TV show. It also comes with vibrating massage and heating features for total comfort and relaxation. You can focus the massage on your legs, thighs, lumbar section, or back; you will also be able to choose from five different massage settings (pulse, press, wave, auto, and manual). A massage timer is the finishing touch for a perfectly customizable massage experience. You might even fall asleep while the massage is still going! All these features make this a serious contender for the best lift chair for seniors. The U-MAX is made soft and sturdy PU leather, and it has extra-thick padding on the back, head, and armrests. Its wall hugger design make it easy to place in any space, since it only needs to be 10 inches away from the wall in order to fully recline. You can control all the functions in this chair through two remotes. It also features two cup holders and four side bags, which will allow its occupant to store bottles, cups, magazines, or books easily. 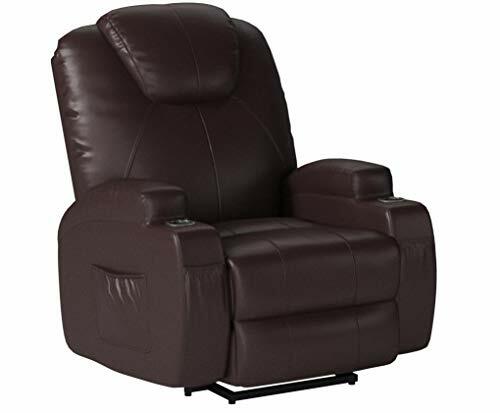 Both the reclining and lift features are completely motorized for greater accessibility. It can support up to 330 lbs. The reviews for this lift chair mention how sturdy and durable, yet comfortable the chair is. Many reviews point out that they bought the chair for their elderly family members, who love how easy it is to recline and then get up from the chair. This features has given greater confidence and independence to many of its users. The heating function is also highly recommended by many users. Most of the buyers also highlight the massage feature, which provides a highly customizable experience that can relieve tension and chronic pain. The chair is easy to use thanks to its motorized systems and two separate remotes. It is easy to assemble and easily supports heavier users. The chair is made of Soft and sturdy PU leather,padded with extra thick sponge for back,head and armrest. all functions are controlled by 2 seperate remotes for your easy use, no need to operate manually..One is for the lift and reclining. the 4 areas of massage focus (leg, tight, lumbar,back) with 5 modes( pulse, press, wave, auto, normal) meet your demand of different massage.